Quebec City is packed with festivals during the summer and winter so these are the peak seasons. From June to September the city is warm and, with schools on break, it can be crowded with families and their children. Hotel room rates are also high. December to February is also a fun time to visit Quebec City if you don’t mind the cold weather and snow. There are fewer festivals and events during the spring and fall: this means that, although the weather is chilly but pleasant, there are far fewer crowds and room rates drop. Fall is the best time to visit Quebec City if enjoy colorful foliage. January is Quebec City’s coldest month with freezing temperatures for both average highs and average lows. The average high temperature peaks at a frosty 18°F (-8°C), while the average low temperature sits at 0°F (-18°C). In February, temperature averages rise ever so slightly to 21°F (-6°C) for the average high and 3°F (-16°C) for the average low. February in Quebec City also means the lowest precipitation rates of the year with an average rainfall of 3 inches (71 mm). March remains very cold despite a significant increase in temperatures. The average high temperature is 32°F (0°C) while the average low temperature is 15°F (-9°C). Quebec City Weather in April: Expect 3 inches (71 mm) of rain in April as cold weather persists. The average high and average low temperatures measure in at 46°F (8°C) and 30°F (-1°C) respectively. In May things warm up quite a bit with the average high temperatures rising to 63°F (17°C). 42°F (5°C). Meanwhile, the average low temperature remains chilly despite rising to 42°F (5°C). June brings a comfortable climate with the average high and average low temperatures ranging between 72°F (22°C) and 51°F (11°C). In July, Quebec City gets its warmest temperature averages as the high temperatures average at 77°F (25°C) and low temperatures average at 56°F (13°C). This is the month with the highest precipitation rate as well with an average rainfall of 5 inches (128 mm) to be expected. Quebec City Weather in August: The temperatures begin their downward trend again in August as the average high temperature takes a small dip to 74°F (23°C). Likewise, the average low temperature also decreases to 54°F (12°C). September sees temperatures decreasing by up to 10 degrees as the high temperatures sink to 64°F (18°C) and the low temperatures drop to 45°F (7°C). In October, precipitation averages at about 4 inches (102 mm). The average high temperatures and average low temperatures decrease to 51°F (11°C) and 35°F (2°C) respectively. November brings a huge drop in temperature averages as the low temperatures measure in at 24°F (-4°C). Days are not much warmer as the high temperatures average at 37°F (3°C). In December, temperatures are the third coldest out of the year with an average high temperature of 23°F (-5°C). The average low temperature sinks to 8°F (-13°C). Despite the sub-zero temperatures and bone-chilling nights, the winter season is one of the best times to visit Quebec for winter sports like snowboarding. It’s also the best time to enjoy festivals like the Carnaval. However, if you’re after the best of Canada’s maple syrup, make sure to play your between in March or April where the maple sugar shacks are at their best and busiest. Festivals in Quebec are fantastic during the summer months of June through September. There are several ways that visitors can arrive in Quebec City. The Jean Lesage International Airport is the city’s main airport. Although it is served by several major airlines, it is a small airport: some airlines fly into the larger airport in Montreal and then continue to Quebec City. Canada’s VIA Rail system offers trains from Toronto via Montreal to Quebec City: the city’s train station is called Gare Central in Lower Town. 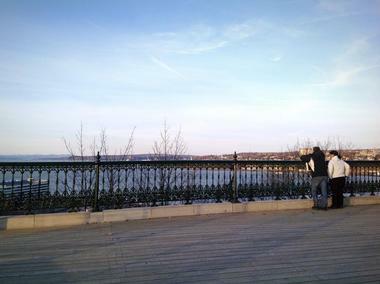 There are several ways that visitors can arrive in Quebec City. The Jean Lesage International Airport is the city’s main airport. Although it is served by several major airlines, it is a small airport: some airlines fly into the larger airport in Montreal and then continue to Quebec City. Canada’s VIA Rail system offers trains from Toronto via Montreal to Quebec City: the city’s train station is called Gare Central in Lower Town. Although Quebec City’s Jean Lesage International Airport is small, it offers several ways to get into the city. The Reseau du Transport de la Capitale (RTC) runs a bus, the 78 route, from the airport into the city. There are about a half a dozen car rental agencies at the airport: the offices are on the main floor of the airport’s administrative building. These companies offer a full range of vehicles from which visitors can choose. There are four taxi companies that offer transportation from the airport into the city. There are also four limousine companies that are available at the airport. 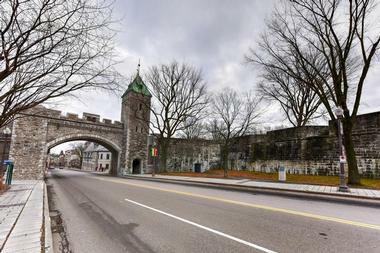 Most of Quebec City’s attractions are found within Old Quebec’s city walls. This means that you will be able to see most of what you want to see just by walking. There are many quaint cafes and shops where you can rest if you get tired of walking. The city’s Metrobus is a good system for tired walkers. It offers four routes through Old Quebec and stops at major attractions. There are single fares, discounts for children, seniors, and students; there are also one day and five day bus passes. A funicular takes you from Lower Town up to the Upper Town. There are many taxis in the city, but driving your own car is not recommended. At one time Quebec City did not have the same level of dining that Montreal had. This has changed somewhat in recent years, and now there are many restaurants that equal restaurants in major cities in North America. This is partly due to young chefs who prepare creative dishes using local ingredients. Unlike some cities, Quebec City’s touristy restaurants actually serve good meals for lunch. People in Quebec City tend to eat dinner earlier than in other cities like Montreal. The most affordable way to eat in Quebec City is to choose the table d’hote, or fixed-price meals. 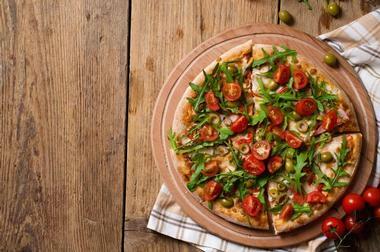 These generally include a soup or salad, a main course, and a dessert. Old Quebec is like an old European city in many ways. 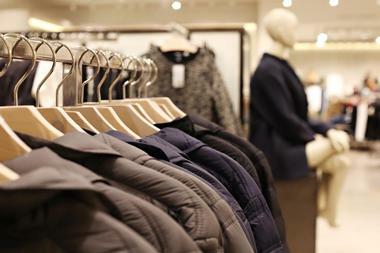 Shopping in Quebec City is a pleasant experience. If you are looking for antiques, start at the street called Rue St-Paul near the waterfront in the Lower Town: two shops here are Machin Chouette and Les Antiquites Bolduc. In Upper Town one of the best shopping areas is in an area called Nouvo Saint-Roch: on the eastern end of Rue St-Joseph you’ll find designer shops while there are consignment shops and pawn shops on the western end. With more then 350 shops, Laurier Quebec is the biggest mall in the city. Quebec City is made up of several neighborhoods, the most famous being Old Quebec’s Upper Town overlooking the St. Lawrence River. 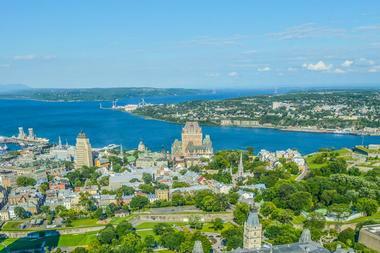 Here the attractions include the Basilica of Notre-Dame, the Chateau Frontenac, and south of this is the Citadelle. Most buildings in this neighborhood are at least 100 years old. Lower Town contains Vieux-Port, the old port district; the Place Royale, one of the prettiest squares in the city; and the Museum of Civilization. Parliament Hill is just outside the walls of Old Quebec. The Parliament building is here as well as the Plains of Abraham where the French and British fought. The Musee National des Beaux-Arts is also in this neighborhood. With its Old World charm, Quebec City is a popular and romantic choice for a wedding. 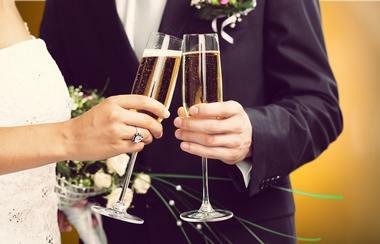 Some of the hotel wedding venues in Quebec City include the famous Fairmont Le Chateau Frontenac, the Hotel Le Concorde Quebec, the Quebec City Marriott Downtown, the ALT Hotel Quartier DIX30, the Hotel Ambassadeur Quebec, and many more. With its unique historic charm, the Auberge Saint-Antoine provides banquet rooms for weddings and receptions with its award winning restaurant, Panache. The Moulin Wakefield Inn is located just outside of the city; it is set in the Gatineau Hills close to the river and MacLaren Falls. Other wedding venues include the Courtyard Quebec City, the Rivera Reception Hall, and more. Quebec City offers a wide range of accommodations from boutique hotels to skyscraper hotels with stunning views of the St. Lawrence River. 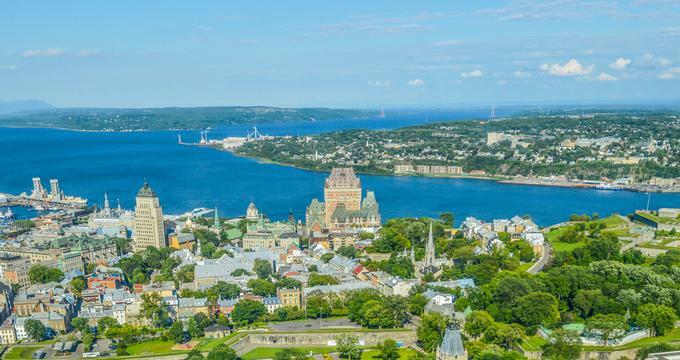 Luxury hotel properties include the Fairmont Chateau Frontenac, the Auberge Saint-Antoine, Le Bonne Entente, the Hilton Quebec, the Hotel Chateau Laurier Quebec, and others. In Lower Town, there are many well-appointed boutique hotels that are worth checking out: these combine beautiful decor with the high-end service of luxury properties. There are also international hotel chains in Quebec City as well as bed and breakfasts run by locals. Quebec’s Ice Hotel is recreated every winter: it sports a new design each year.